33 years, 6 months, 28 days old age. Ambati Rayudu will turn 34 on 23 September, 2019. Only 5 months, 2 days, 11 hours, 13 minutes has left for his next birthday. Ambati Rayudu has celebrated the total number of 33 birthdays till date. See the analysis by days count and bar graph. 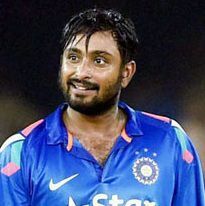 Ambati Rayudu was born on 23-09-1985 in Guntur in the state of Andhra Pradesh, India. He is an Indian Cricket Player. Ambati Rayudu was considered as a teenage prodigy but his clashes with authorities led to his downfall in the initial part of his career. He is a fluent stroke-maker and was hailed as country’s next great hope after his inning of 177 not out against the England team in a U-19 series. He was just 16 then and after such heroics at the under 19 level, he was included in the Hyderabad domestic team. At 17, he made his first-class debut and scored one double and one hundred in his very first first-class season. He joined rebel Indian Cricket League at the age of 21 and his hope of representing India almost got over. After the league terminated in 20009, he wholeheartedly accepted amnesty offer offered by the BCCI and in the third season of the IPL, he was included in the IPL team Mumbai Indians. Harbhajan Singh predicted it then, that he is arguably a special talent and will soon be seen in the Indian team. He was a prolific run-maker for the franchise in the 3rd and 4th editions and since his debut for them, he has played for them in all the seasons concluded thus far. After some impressive performances at the IPL and at the domestic level, he was called on the Indian side when a low-profile team was sent to Zimbabwe in 2013. He was also a part of the 2015 ICC World Cup but didn’t get to play a single match. He was bought by IPL franchise CSK in the 2018 IPL player auctions. He had a dream run that season and was soon recalled to the Indian side. In his second stint with the national team, he played some match-winning knocks and presented a strong case against the selectors for the 2019 World Cup. Selectors though had other ideas for him and he was denied the berth in ICC World Cup 2019. He was born to Sambasiva Rao and Vijayalakshmi. He is married to Chennupalli Vidya. He was captain of the U-19 World Cup played in 2004. Veteran players like Dinesh Karthik, Suresh Raina, and Irrfan Pathan played under his captaincy. In his early career, he was referred as the Next Sachin Tendulkar of Indian cricket. After missing out on selections even after playing well in domestic cricket, he joined the rebel ICL (Indian Cricket League). He was back into the fold after quitting ICL and started playing for Mumbai Indians from 2010.